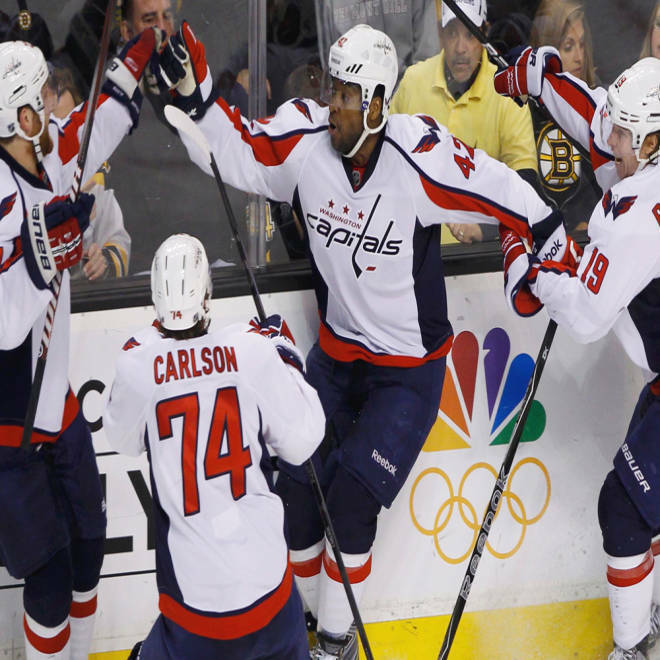 Washington Capitals' Joel Ward, center, celebrates after scoring the game-winning goal against the Boston Bruins in Game 7 of the NHL Eastern Conference quarter-final hockey playoff series on April 25. His feat was met by a barrage of racist tweets. Should schools punish students who tweeted racist remarks after a black pro hockey player scored the winning goal to knock the Boston Bruins out of the NHL playoffs? Administrators at high schools and colleges in New England are wrestling with that question, straddling a fine line between free speech and socially incorrect remarks that shame the school. Hordes of angry hockey fans – presumably Boston Bruins fans -- unleashed a barrage of racist rants on Twitter and other social-networking sites after the Washington Capitals beat the defending champion Bruins a week ago Wednesday on an overtime goal by Joel Ward, the Capitals’ 31-year-old left wing. Ward is one of just a handful of black players in the NHL. According to local media reports, several students at high schools in Gloucester and Danvers in Massachusetts, the Cumberland, R.I., School District, and Franklin Pierce University in New Hampshire were among the tweeters. Ward brushed off the denigrating comments. “It's a few people that just made a couple of terrible comments, and what can you do? I know what I signed up for. I'm a black guy playing a predominantly white sport. It's just going to come with the territory,” he told reporters last week. Racist tweets that have since been taken down were traced to at least five Gloucester High School students, including at least three student-athletes, The Gloucester Daily Times reported. Gloucester School District Superintendent Richard Safier, in a statement issued to the local newspaper two days after the game, said the district is “conducting a full investigation and will consider whether disciplinary action is warranted, and whether the schools have jurisdiction. "Second, we will implement a strong educational component that looks at the social, moral, and legal aspects of such remarks," he added. Safier did not return a call from msnbc.com this week about the status of the investigation. Jonathan Pope, chairman of the seven-member Gloucester School Committee, which sets school policy, said the committee doesn’t “have anything on the books” that addresses scenarios like the racist hockey tweets. At Franklin Pierce University, a private college in Rindge, N.H., administrators said they were investigating “vile racial slurs” tweeted by a freshman after the Bruins’ loss. “This first-year student, who is not a part of any Franklin Pierce University athletic team, will be addressed appropriately and in accordance with our Student Conduct Code,” the university said in a statement. A university spokeswoman said student privacy issues prevent the school from disclosing details of the case and possible disciplinary action. Franklin Pierce students and faculty upset by the tweets held a “Take A Stand” rally Wednesday at the campus courtyard. In Danvers, Mass., a 17-year-old who reportedly used the N-word in a tweet referring to Ward was fired by the sandwich shop where he works, according to the Danvers Herald. The teen is a student at St. John’s Prep, a private, Catholic high school for boys. “As a school community, St. John’s Prep stands against racism in any form, and we are deeply disturbed by the remarks posted online following the Bruins game on Wednesday, April 25. In keeping with school disciplinary policies, we are investigating the matter at this time,” the school said. A school spokeswoman declined further comment on any potential action the school might take. In Cumberland, R.I., school Superintendent Phil Thornton said a junior hockey player posted a racist tweet under his own name, followed by the name of his high school. In a follow-up radio interview on WPRO’s “The Dan Yorke Show,” Thornton wouldn’t specify what actions, if any, the school might take. He noted that students are entitled to free speech as long as they don’t disrupt the learning environment, but those who participate in extracurricular activities such as sports sign an agreement to abide by a code of conduct. "It says in there, students doing anything unbecoming, i.e. Twitter, social networking, may have a consequence,” Thornton said. "In terms of after-school activities, these students are ambassadors. What they say and what do, how they conduct themselves, matters." Whether schools can punish students for what they post online via social-media networks is not clear-cut. A 1969 U.S. Supreme Court decision, Tinker vs. Des Moines, found that public schools could only punish students’ speech if they could show that the activities “would materially and substantially” disrupt the school’s educational mission. In a more recent case, the Supreme Court in 2007 ruled against an Alaska high school student who argued his free-speech rights were violated when he was suspended for unveiling a “Bong Hits 4 Jesus” banner across the street from the school during the 2002 Olympic Torch Relay. The court said the banner could be interpreted as a pro-illegal drug-use message at a school-sanctioned activity. “It gets tricky because the Supreme Court’s standard for schools being able to punish or discipline students is where speech causes a disruption in school or hurts the learning environment. That’s the legal standard,” said Eric P. Robinson, deputy director of the Reynolds Center for Courts and Media at the University of Nevada-Reno and former staff attorney at the Media Law Resource Center. In the hockey tweets case, “it might be a little hard for school administrators to show that sending those messages disrupts school directly,” said Robinson, who also blogs about Internet law and policy. Adam Goldstein, attorney advocate with the Student Press Law Center, an Arlington, Va.-based organization that advocates for students' First Amendment rights and free online speech, said disciplining students for hateful speech is counterproductive. Pope, of the Gloucester School Committee, seemed to agree. “I think ultimately it’s a parental issue. On the district level it’s really an issue of us trying to use it as a teaching moment and use it to have discussions around diversity and racism," he said. “We work very hard, but ultimately the parents are the main educators of children." As to the fine line between students' free speech and potentially disruptive speech, Robinson notes that Twitter, Facebook and other social-networking sites weren’t around when the Supreme Court issued its landmark Tinker vs. Des Moines decision, a case that involved students wearing black armbands to protest America’s involvement in the Vietnam War.